Nestled among the rolling hills of central Iowa is Maytag Dairy, which produces Maytag Blue cheese. Shortly before World War II, F.L. Maytag II began working with scientists at Iowa State University to begin making a great American blue cheese, modeled after those of Europe. The result was one of the first American farmstead cheeses of superior quality. Today, Maytag cheese makers are still hand-making the same exceptional cheese that they created in the 1930's. 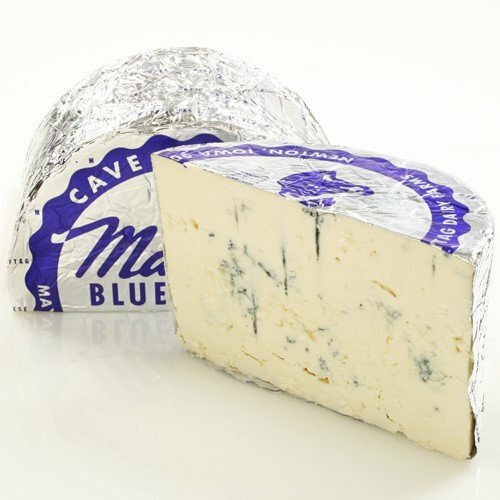 Maytag Blue's popularity has taken off with the growing interest in American farmstead cheeses, and this wonderful, tangy blue cheese is now featured on menus across the country. Its wonderful flavor, moist yet crumbly texture, and lemony finish make Maytag one of the world's great blue cheeses. Photo depicts whole 4 lb form of cheese.